(TibetanReview.net, Oct20, 2016) – The government of the Czech Republic sought to preempt an outburst of anger and threats from China over the fact that some of its top leaders had on Oct 18 met with the visiting exiled spiritual leader of Tibet, the Dalai Lama, by issuing a statement, distancing itself from their action. 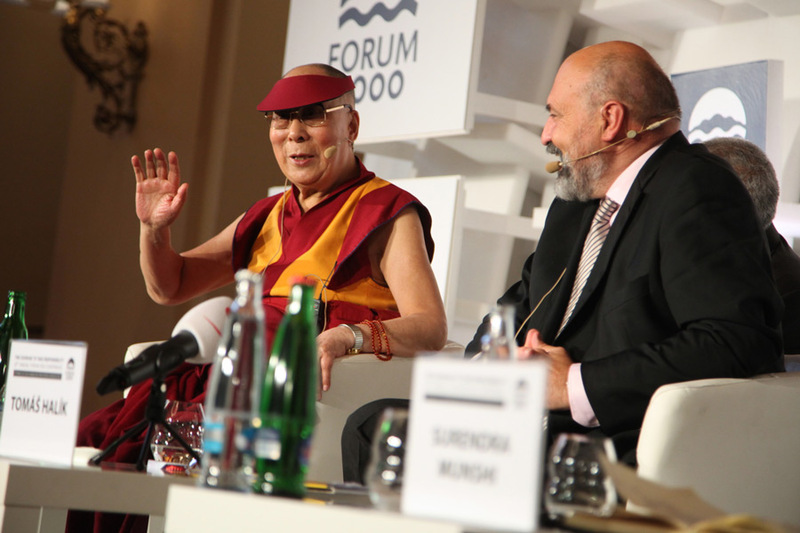 The Dalai Lama was in the country to take part in the 20th annual Forum 2000 international conference, co-founded in 1996 by the country’s late first president and his close friend Mr Vaclav Havel (1936-2011). The Dalai Lama had met with the country’ Deputy Prime Minister Pavel Belobradek, Culture Minister Daniel Herman, and the deputy speakers of both houses of parliament before the conference. He took part in a roundtable exchange with them. At the conference the Dalai Lama took part in a panel discussion on the Paradox of Religion, a closing panel on The World and Its Current Challenges, while his final meeting of the day was with the Forum 2000 International Advisory Board. Also, Czech president’s spokesman, Jiří Ovčáček, tweeted that, in meeting with the Dalai Lama, the “minister of culture had chosen media fame ahead of the interests of the Czech Republic and its citizens”, reported radio.cz/en Oct 18. It added that by contrast, the culture minister told the Dalai Lama himself it was “a great honour to meet and to be able to discuss spiritual values”. In 2015, China was grateful for Zeman’s attendance as the only western leader at a military parade in Beijing to mark the end of World War Two. The Dalai Lama’s meeting was with politicians from the small centrist Christian and Democratic Union party, the junior partner in the leftist-led coalition government to which Deputy Prime Minister Pavel Belobradek, Culture Minister Daniel Herman and the deputy speakers of both houses of parliament belong. Chinese President Xi Jinping had visited Prague with a business delegation in March and subsequently China’s CEFC – one of the country’s top 10 private firms – spent around a billion euros on stakes in a Czech airline, a brewery, two media groups and a top football team. Earlier, China’s Foreign Ministry said Oct 17 that it would retaliate after Slovak President Andrej Kiska met the Dalai Lama.